Somewhere along the way one discovers that what one has to [blog] is not nearly as important as the [blogging] itself. I was intrigued when the Good Doctor Bryan Alexander blogged his discovery of a twitter cloud tool. Tweetclouds generates this once granted your tiwtter user name. I wanted one! Bryan has one! But when I tried (several times) all I got were blanks. No clouds. No tags. @cogdog looking at your profile though you do not have more than that. Looks like i have some debugging to do. and he provide the link so I could get the image above. Now this may sounds just like gee-wiz isn’t the net neat, but the notion of putting out a request and people responding with not just like form mail ‘Thank you for submitting your feedback, someone from Acme Software will respond to you in 3-4 business days" — but a real human, and useful, quick response like John did… and it was not even me making a direct request! He is out there listening. Someone ought to be rolling this into some sort of motivational speech machine and do the lecture circuit. Slap a 2.0 on it and charge $1000 bucks a head to tell ’em how to ride the cluetrain. If you have not had one of these quick twitter give backs, just keep putting the questions, requests out there. Give, ask, tweet, get back. Being there, for sure. Hi (got here via Sue Waters)! Twibble does the same – Twibble is an app like Twhirl etc but with Geotagging and a Phone client. But Twibble has real people living in Twitterland. They tweet back. Its real its cool wow ! A compliment to Twitter and the heads up guy using it – John. I heard John present on MashUps at eLearning 2008 – impressed by what he is trying to do at his institution. 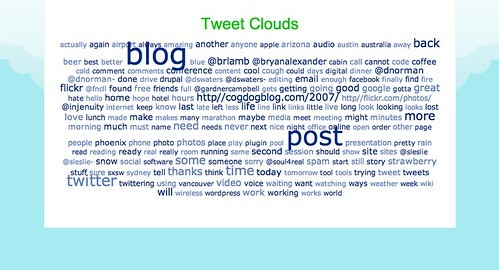 Tweetclouds.com was my first foray into using the twitter api to mashup content. As a doctoral student one of my major interests is folksonomies so mashing up twitter and a tag cloud generator seemed natural. Will have to check out twibble. For me this is one of the major benefits of using twitter as part of my PLE even if you do not directly as for help often times help comes anyway. Twitter is just a big Karma Dealer, if you are open, sharing , and caring, it will come around and pay good dividends. Okay sorry but I’m still sulking cause obviously I’ve been twittering too much & can’t create a twitter cloud :(. Diigo did contact me immediately when they heard via twitter I had problems with their toolbar in FireFox. I wonder with main stream will realise the new way of doing business? Interesting to see what a “prolific” poster’s cloud looks like! John you are my hero. Thanks for creating my TweetCloud. Definitely cool to see what I post the most about. I hope every one notices that I mention good a lot that must mean I’m good :). No one’s mentioned the Rolling Stones yet? Super-cool stuff, everyone. Wonderful to read the snarkfree love. That’s not the same as snark freelove, mind you. Ok, all joking aside, I can’t get a tweetcloud either. Alas! GardnerCampbell has 2813 updates. At 20 updates a page GardnerCampbell has 141 pages of tweets.